Phoenix Australia’s internationally recognised research and evaluation program advances knowledge of trauma and posttraumatic mental health. We draw on our national and international collaborations, integrating findings from our research and evaluation activities with advances from around the world. As international leaders in trauma research and evaluation, we attract competitive and non-competitive research grants, and have a long track record of successful collaboration. We conduct research in a wide range of areas to advance trauma knowledge and answer questions with our research partners. Our specialist researchers utilise many research designs and methodologies to answer important questions. We conduct the following types of research. Epidemiological research is concerned with the prevalence and causes of disease in a given population (for example, the prevalence of posttraumatic stress disorder in a military population). It investigates who develops disorders and why (for example, what factors protect against PTSD, what other disorders coincide with PSTD?) Our epidemiological research comprises two main arms: prevalence and vulnerability. Our research into the prevalence of PTSD and other psychiatric disorders in the general population and specific populations, such as injury survivors, is recognised internationally. Our vulnerability research includes large longitudinal studies of hospitalised injury survivors, people experiencing homelessness, compensation seekers, and veterans. Phenomenological research investigates the nature of disorders, how they manifest themselves over time, and how they may exist together. Our phenomenological research has examined the underlying (latent) factors which characterise PTSD and trauma-related disorders. We have investigated the development and testing of DSM-5 PTSD criteria, the effects of different types of trauma on PTSD symptoms, pain and trauma, delayed PTSD, and nightmares in PTSD. Intervention research asks, what treatment works? Our intervention research includes evaluating novel and existing prevention and treatment programs (for example, randomised controlled trials), real world trials conducted in the field (for example, evaluation of a telephone-based therapy to treat people in their homes), and studies designed to establish expert consensus. Our intervention research focusses on two types of interventions: universal and indicated. Universal interventions are those given in the early aftermath of a traumatic event, and focus on enhancing the natural strengths of trauma survivors. Indicated interventions are designed to treat established mental health disorders such as PTSD, depression, or substance use, and can only be provided by trained mental health professionals. Examples of our intervention research include landmark studies testing the effectiveness of early intervention for posttraumatic mental health, telephone therapy, cognitive processing therapy, and transdiagnostic therapy. Knowledge translation involves evaluating or implementing treatments and approaches that are research-based, or informed by research, to improve services. Phoenix Australia has a strong commitment to applied research and evaluation that leads to effective, realistic and sustainable improvements in the day-to-day practice of clinicians and services as they support people’s emotional recovery after trauma. We have a strong focus on evaluation to determine the impact of practices and services in achieving their aims. We translate scientific knowledge into accessible policy, training, advice and resources. We have a strong track record of knowledge translation initiatives with government departments, agencies and services that assist veterans, Defence personnel, emergency services, sexual assault counsellors, homeless support agencies, and child and family sector services. Our applied research has enabled organisations to develop policies and practices framed in the best available evidence. An important part of our knowledge translation is to monitor relevant literature and conduct scientific literature reviews for organisations which extend traditional approaches to include systematic reviews and rapid reviews that address policy needs and service requirements. Our content and research expertise allows trauma knowledge to be translated for patients, practitioners, and policy makers, and our translation activities span print and electronic media. Click here to view and download our Annual Literature Scans for the Department of Veterans’ Affairs. 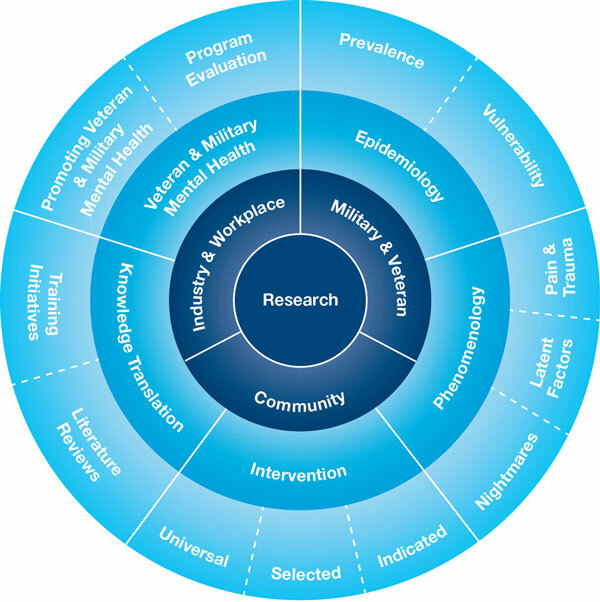 Veteran and military mental health research explores mental health and wellbeing in the veteran and serving military populations, including studies of policy/program evaluation, research translation, and knowledge creation. We work closely with the Australian Departments of Defence and Veterans’ Affairs to help improve health and wellbeing for serving and non-serving personnel. The studies we conduct in veteran and military mental health include contributions to conceptual and methodological issues as well as evaluations of programs, services, and innovative interventions (for example, website and digital products). The results of these studies naturally have broader application, and can inform work with other populations and services. Contact us to discuss our research and how Phoenix Australia can assist your organisation to reduce the negative impacts of trauma for people you work with.